If you like birds in your garden encourage them with appropriate plants. Some birds like the seeds in the berry others are keen on the fruit as a whole. Fieldfare, redwings blackbirds thrush and sparrows are just some birds that like a berry good feed. Berberia thunbergii will thrive in full sun producing small flowers and long lasting red berries. Dog woods like cornus alba will produce creamy white flowers followed by grey coloured berries. Cornus florida is a tree rather than shrub with red berries. Malus floribunda or Crab Apples are potentially very decorative and produce an abundance of fruit. 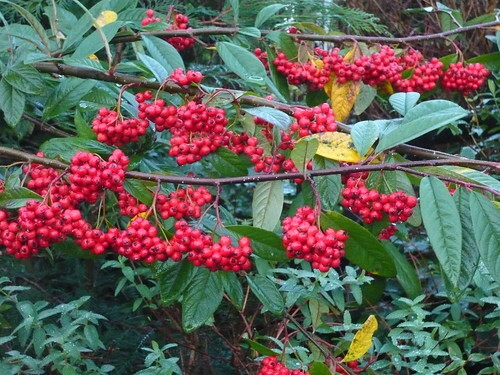 Mountain Ash or Sorbus aucuparia is a small tree with sprays of orange or red berries in autumn. Viburnum trilobum has glossy leaves turning red in autumn. The berries are bright scarlet. Most of these berry bearing bushes have good autumn leaf colour. They all earn there place in the garden. Cotoneasters horizontalis or the vertical Cotoneaster bullatus keep there berries into late winter when bird food is scarece. The Elder, Sambucus nigra has elderflowers that can be made into wine but then the black berries will not be there to feed the birds. 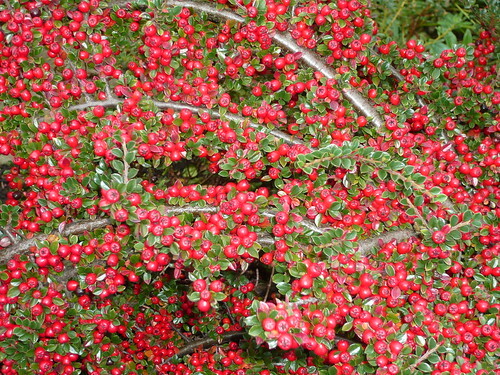 Holly, Ilex aquifolium is a well known evergreen that needs a male and female plant to produce lush red berries. Ivy Hedera helix and Dog Roses also fruit for birds. Daphne mezereum and Honeysuckles are grown for the scented flowers but also produce berries. Pyracanth, Hawthorn, Blackthorn the list can continue for a longtime. Give the birds a treat and see what species you attract. Great tips and what a wonderful cononeaster photo. We are running an RHS workshop soon on how to garden for birds, bees and butterflies – The more gardens bursting with nature the better. 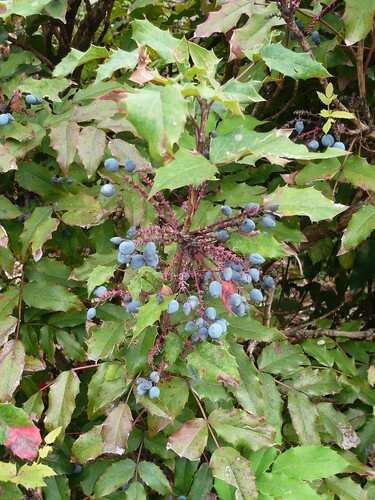 Mahonia too – our blackbirds love the berries!